Need a new Laptop? This 2018 Laptop Buying Guide features my top 10 tips for choosing the perfect laptop for you. You could just go on Amazon, type in Laptop and filter by size, price and customer rating – that’s one way of doing it – but laptops aren’t cheap, and you want to make sure you’re getting good value for money and the right one for you. So give me a few minutes, and i’ll run you through 10 things you need to know to help you choose the perfect laptop – and I’ve put links to some of my recommended laptops in the description – and if you want to add anything to this list put it in a comment below. So First things first – do you prefer using Windows, Mac OS or ChromeOS? There’s no right or wrong answer, and it’s usually best to stick with that you know. Windows is by far the most common platform, so you’ve got the greatest range of laptops to choose from. Mac OS is obviously exclusive to Apple Macbooks and Macbook Pros which are beautiful machines and really easy to use, but also relatively expensive, there isn’t much variety, and the latest models have a limited range of ports. ChromeOS is very popular with students, as you can find lots of really cheap laptops running the cloud-based OS – if you’re on a budget and just doing basic things like using google docs, streaming netflix and sending emails – a Chromebook could be ideal. Personally though,I tend to go for Windows 10 as I’ve got more options to choose from – so I can get the specs and features I want. And if you’re into gaming, windows machines are pretty much you’re only option right now – although click at the top right to see my video on how game streaming on PC and Mac could be the future. Okay next question – Do you want a normal ‘clamshell’ laptop like this [show] – a 2-in-1 convertible touchscreen laptop like this – or would you prefer a fully detachable hybrid 2-in-1 where you can use the screen as a tablet? It’s great there are so many options these days, and if you like the idea of using your laptop as a notepad or canvas, maybe you often give presentations from your laptop, or you just watch a lot of youtube and netflix on it – having a convertible laptop you can use in tent, tablet or stand mode gives you a lot more flexibility and touchscreens can make these laptops easier to use. And then we’ve got Hybrid 2-in-1 like this Acer Switch 3 or the Surface Book 2 which are fully detachable and mean you essentially you have a laptop and a tablet. There are downsides though – generally these 2-in-1 devices are more expensive than a similarly spec’d normal laptop and quite often they won’t be as powerful due to size and design restrictions. That’s not always the case though, this Surface Book 2 is one of the most powerful non-gaming laptops you can buy, but it all comes at a cost – starting at £1500, and rising to £2500 for this model – and that’s just the 13-inch one. 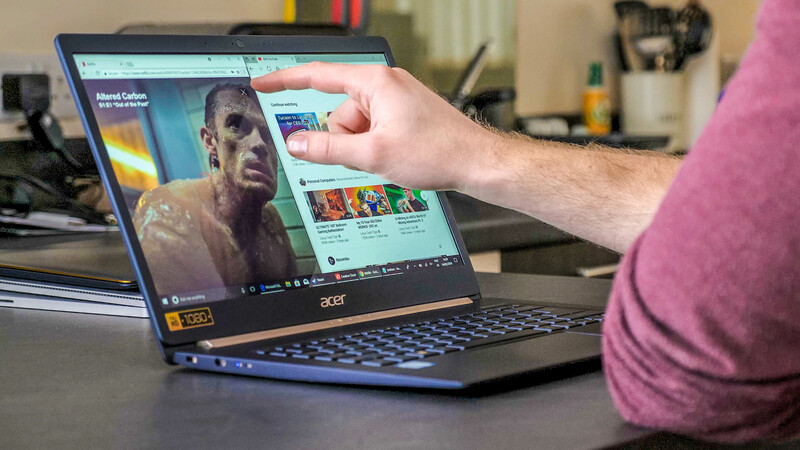 So let’s talk about size – most laptops have 13, 14 or 15-inch screen sizes – you do get a few 11” budget laptops, and some huge 17 or 18” gaming beasts – but we’ll talk more about in a bit. Generally the smaller the screen size, the lighter and more compact it is – so 13 and 14” ultrabooks – which is just a fancy name for thin and light laptops that use intel chips – make great travel companions – anything bigger and you’ll struggle to get any work done on trains or planes! But bigger 15-inch laptops can be more powerful, with space for dedicated graphics cards and more power hungry processors. And The good news is that brands are putting bigger screens into more compact, travel friendly bodies by trimming the size of the bezel around the screen. So the Dell XPS 15 fits inside a 14” body, and the XPS 13 into a 11” body. Loads of laptops are coming with thinner bezels now including HP Spectre, ASUS Zenbook and Acer Swift models. So really if your laptop is going to stay at home or at the office all day, you might want to go for a bigger 15-inch model, whereas if you travel a lot or don’t want anything heavy in your backpack, a 13 or 14” ultrabook could be just the ticket. Or if you can afford it, a high-end Macbook Pro 15, XPS 15 or Surface Book 2 15-inch are relatively compact for the size and offer really high end performance. You’re looking at the screen the whole time you’re using it so you want to make sure it looks good. Firstly, make sure it’s got an IPS screen – just check the tech specs or reviews to see if IPS is mentioned, as that offers much better colour accuracy and viewing angles. The alternative is TN screen, which is still used on some cheaper models and is okay – but it can look grainy and viewing angles are poor. The other main thing to consider is resolution. But don’t worry too much about this, ideally go for a laptop with a Full HD – so 1920 x 1080 resolution. Because even though everyone is talking about 4K, unless it’s a 15-inch or bigger laptop and you really want the extra pixels for watching 4k movies or you’re editing 4k video, i’d avoid it as it has a big impact on battery life and your framerate in games, and it’s unlikely you’d really notice the difference. Right Let’s talk specs – aside from price this is probably the most important thing to look for – but don’t worry i’m going to keep this nice and simple. Processor, RAM and storage are the big three – unless you want a gaming or workstation laptop where you might want to consider graphics cards as well – i’ll talk more about that in a minute. The most important thing is the processor – you’ll see most mid-range of high-end laptops come with a Intel Core i3, i5 or i7 processor. Generally the higher the number, the better performance you get. Unless you’re doing lots of video editing or more intensive tasks, a Core i5 will be just right. But also look for what generation it is – every year they get refreshed and improved – with the latest 8th gen processors offering a significant boost over last years, now offering 4 cores rather than 2 – which is better multitasking. How do you check? Well in a laptops’ specs, look for the first number after the i3, i5 or i7 – if it’s an 8 – like i5-8250U or i7-8550U – that’s the latest 8th gen chips. 7th gen is still fine – this XPS 15 for example has an i7-7700HK and that’s still very powerful – but where possible always go for the latest one. Intel chips are by far the most popular, but in 2018 we’re going to see more laptops powered by AMD Ryzen processors which are really good as well – although I’ll save the Intel vs AMD debate for another video. Some cheaper laptops will come with Pentium or Celeron processors – unless you’re using it for basic tasks or are on a super tight budget – i’d try to avoid those as a rule of thumb. Keeping it simple – look for a laptop with an 7th or 8th gen i3, i5 or i7 and you can’t go too far wrong. RAM is much easier – usually you’ll get 4, 8 or 16GB of RAM in a laptop. Unless you’re going for a really basic laptop I’d avoid 4 gigs – The sweet spot is 8GB and means you can have loads of internet tabs open and multiple programs running without any major slowdowns. For video editing, rendering, any sort of power user – go for 16GB where possible. And finally storage – I can’t stress this enough but make sure the laptop has an SSD – that’s a solid state drive. This is a newer and much faster kind of hard drive, which makes things like booting up windows, opening programs, and generally using the laptop feel so much faster. Some laptops have both – like a 32 or 128GB hiSSD, and then a second higher capacity hard drive. That’s fine too, and is arguably the best of both worlds. You get the SSD speed boost for windows, but also enough storage space for all your files. So let’s say you want a good all-round laptop and have a budget between 500 and 1000 – look for an i5 processor, 8GB of RAM and at least a 256GB SSD. If you’re happy to spend a bit more or you’ll be doing more intensive tasks – go for an i7 with 16GB RAM and a 256 or 512GB SSD. If you’re on a budget, look for an i3 or i5, 4GB of RAM and 128GB SSD or SSD plus hard drive combo. So that’ll be more than good enough for most people and will play some games at lower settings – but what if you want to play games or you’re doing high-end 4k video editing or rendering. Look for either Nvidia GTX or AMD RX or AMD Vega branding on a laptop – that means it has a dedicated graphics card which will make your laptop a lot more powerful and capable of playing games with higher settings and at higher resolutions. The 13” Surface Book 2 and Dell XPS 15 come with a Nvidia GTX 1050 – and gives you enough power to play games at medium to high settings at Full HD. Higher end gaming laptops will offer better performance – but generally the more powerful the graphics card, the bigger, more expensive and worse battery life a laptop has. I will be making a separate video on this if you want to know more about gaming notebooks – so make sure you click tap subscribe and that bell notification icon so you don’t miss it. USB, HDMI, Card Readers – Ports are really important and to be honest all I’d recommend is making sure the laptop comes with at least one USB Type C port – that’s the same one the latest Macbook Pros exclusively use. It is still relatively new, but it can do pretty much everything and will definitely future proof your laptop if you have one. But if it doesn’t and you want to output the screen to a external monitor, make sure it has a HDMI port instead. But even if you the best specs and it’s really fast, if the keyboard and touchpad are rubbish it – it’s not going to be very nice to use. In my experience Macbooks have the best touchpad – it’s big, responsive and there’s great gesture support in MacOS. For windows laptops, try and get one with a Microsoft Precision Touchpad. This basically guarantees the touchpad will be fast and precise. If you’re not sure, just google the laptop name along with precision touchpad and see if any reviews mention it. Don’t worry too much if it doesn’t have it, but you might want to try it out in a store first to make sure it feels good to use – which i’d also recommend for the keyboard as there’s no simple rule of thumb for knowing how nice it’ll be to type on unless you try it first. Some people look at key travel as an indicator, the more travel, the better the keyboard – but i really like the Macbook Pro keyboards and they have a very small amount of travel so it’s not foolproof. To be honest though, you can’t go too wrong – the worst you’ll get is a keyboard that feels a bit spongy so don’t worry too much. Check the keyboard is backlit though, as this makes it a lot easier to use in the dark. But what about battery life – how long should the laptop last. Anything quoted above 6 hours is decent, but since most brands test them at low brightness, if a retailer listing says 6 hours, expect more like 4 in the real world. The size of the battery, 4k resolution screens, graphics cards and older generation processors have the biggest impact on battery life. Try to buy a laptop with the latest processors as they tend to be more efficient and offer better battery lives. Most reviews will tell you how long a laptop lasts, but if you can get one with at least 6, but preferably 8-10 hours, then that’ll do nicely. If you’re still here, I’m really impressed because that was quite a lot to take in but hopefully it’s helped you understand what you need to look for when buying a new laptop. I’ve put a range of my recommended laptops in the video below (click below and open it to YouTube, links are in description).